"This is a great low-fat pasta dish. I serve it to company all the time. Serve with a fruit salad and French bread." Heat the olive oil in a nonstick skillet. Saute asparagus in the pan over medium heat for about 3 minutes. Add chicken broth and mushroom slices; cook 3 minutes more. Drain pasta, and transfer to a serving dish. 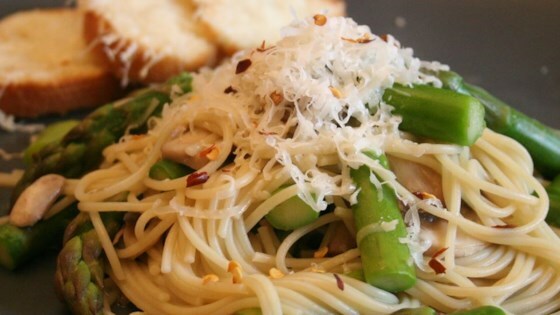 Gently toss pasta with asparagus mixture; sprinkle with Parmesan and crushed red pepper. I added 1 onion and some garlic for more flavour. It was good but nothing special. We enjoyed this recipe, it was a great way to use our own garden-fresh asparagus. But next time, I will add garlic and leave out the crushed red pepper. I will definitely make it again, though. excellent recipe - I cooked the asparagus a little longer and added garlic. it was wonderful. i used it with a garlic chicken receipe and they really complimented each other well.